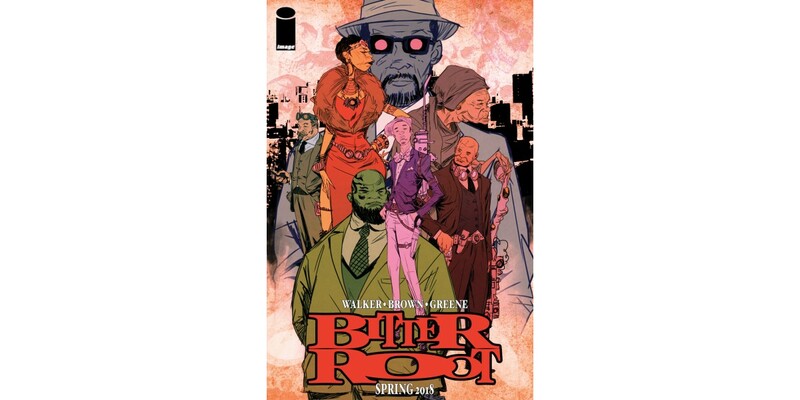 Image Comics is pleased to announce at this year’s Rose City Comic Con an all-new ongoing series from David Walker, Chuck Brown, and Sanford Greene that will launch in 2018 titled, BITTER ROOT. BITTER ROOT is set in 1920s with the Harlem Renaissance in full swing. The new series will follow the Sangerye Family—New York (and the world’s) only hope for salvation from supernatural forces threatening doom and destruction. Once the greatest family of monster hunters in the world, the Sangeryes must move beyond the tragedies of the past, or be forced to sit back and watch an unimaginable evil ravage the human race. “Bitter Root is going to be unlike any comic book people have seen,” said Walker. “We're mixing action and horror, with a cast of characters unique to the medium to tell an epic tale of the Sangerye family and the sacrifices they are willing to make for humanity. I'm excited for this series for several reasons. It gives me the chance to work with Sanford again, Chuck, who is a great co-writer, and Image, which publishes some absolutely amazing comics." Brown added: "Bitter Root is a dream project. Walker, Greene, and I share the same tastes while bringing our own unique talents and perspectives to the book. Bitter Root takes a classic horror genre and remolds it into something new and eye opening. I haven’t had this much fun creating comics in awhile." BITTER ROOT #1 from Image Comics will hit stores in 2018.